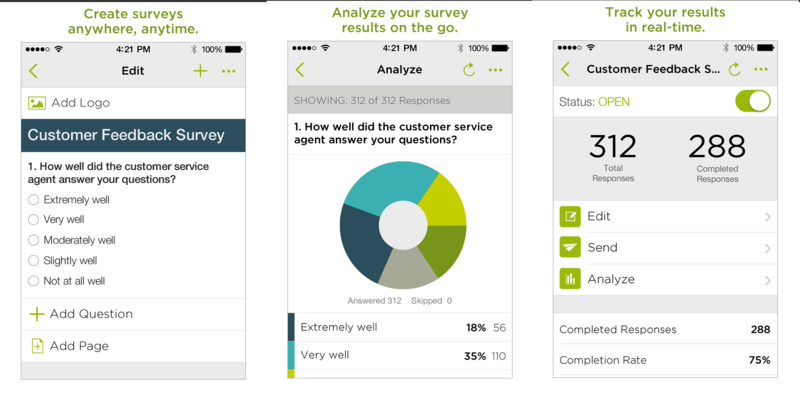 SurveyMonkey, a provider of online survey tools, has launched a mobile app to for users to create, monitor and analyze surveys on the go. SurveyMonkey CEO Dave Goldberg says that the company has seen a 14 times increase in its mobile traffic over the past three years — and an app is a natural progression. The new SurveyMonkey mobile app is currently only available for iOS devices — namely the iPhone, iPod touch and iPad. It’s free and available in the US, Canada, Australia and most other English-speaking markets — though there is also an option to upgrade to a paid plan with more advanced features. Users can create custom surveys and polls through what SurveyMonkey calls an “intuitive user interface,” or more in-depth surveys with available templates designed by experts. The backend is powered by the company’s analytics engine, which means it analyzes data speedily for employees to react to trends identified by their surveys, such as issues with customer satisfaction. At the same time, SurveyMonkey has announced a Mobile Feedback SDK to let developers gain in-app feedback so they can make product decisions as they seek to decrease negative reviews and improve app store ratings. The SDK will be released some time this year for both iOS and Android devices, while a beta program is available now. SurveyMonkey is also integrating mobile analytics solution Flurry, which is used in more than 400,000 apps by over 125,000 developers, into its SDK. Given that SurveyMonkey says it currently powers more than two million survey responses every day, moving to a native mobile experience will no doubt add a layer of convenience for existing users — and even capture a brand new audience that is used to navigating mobile apps instead of Web browsers.